I could have titled this Friday Focus as “Maximizing Your Glutes” or even “Glute Camp”. But I really want to generate a positive, more yogic vibration. No calisthenic connotations here. Then came the idea “Glutton For Glutes”. Although the word “glutton” most often refers to a glutton for punishment, a glutton can also be someone who is extremely eager for something, whether that be food or adventure…hmmm. Lately, I am a glutton for glorious glutes. Because I have come to realize how vital this set of muscles is to my strength, alignment and overall well-being. Also, I am discovering that as my backside slackens (yikes), my quadriceps tighten. There is always a give and take within the body. Here are some of the ways that the strongest muscle in your body, the gluteus maximus, and its supporting actors, the deep rotators, help with developing the overall best picture. All great points for ranking these muscles as number one for strengthening this month. As we addressed in class, many of the one-legged standing poses do this job nicely. Vrksasana (Tree Pose), Virabhadrasana III (Warrior III), Ardha Chandrasana (Half-Moon) and Natarajasana (Dancer’s Pose) all assist with activating the glutes as does Salabasana (Locust Pose). However, there is one other posture that we didn’t have time for in class today. It is the One-Legged Bridge Pose or Eka Pada Setu Bandha Sarvangasana. As you practice this pose, an important thing to remember is to push downward through your shoulders as well as your grounded leg. As you hold the posture, try to interject tiny pulses upward through your extended leg. The trick for persevering with this is to focus on your breath. Extend upwards as you inhale and ground down as you exhale. Remember if it’s not with the breath, it’s not yoga! Thanks to Yoga Journal for the photo! To finish off this month of purification, our classes for the week were geared toward clearing out the old to make space for the new – in a compassionate manner. From this intention, the Compassionate Vinyasa was created. A twist on last week’s flow, this sequence focuses on the region of the heart to remind us to move with kindness in our pursuit of revitalization. Just in time for spring! Once again, I have included a visual diagram (by popular dem and) here. During our Cultivating the Core class this week, a discussion of the postural muscles came up. I mentioned how the psoas muscle was the hidden performer in our core strength and stability. And, because it plays such a large role in many of our yoga postures, I promised to address it in our Friday Focus this week. Pronounced “so az” (the letter p is silent), the psoas is the only muscle that connects the upper body to the lower body. Basically, it is fundamentally responsible for your posture and regarded as the most important skeletal muscle in the body. Technically, the psoas is made up of two muscle groups, the minor and the major psoas. The major psoas is attached all along the lumbar spine and travels deep from the back of the body to the front of the body where it inserts on the inside of the femur (or thigh) bone. The minor aspect, being smaller and nearly function less (since we are now an upright standing species), joins the top of the lumbar spine to the inside of the pelvis. To make things more complicated the psoas is also part of a larger muscle group called the iliopsoas which includes the iliacus. It stretches from the iliac crest (top of the hip) to the femur. Together the three muscles are integral to hip movement. Needless to say the psoas’ involvement in body function is immeasurable. Physically, it is essential to our balance, critical to healthy alignment and a major stabilizer. It functions along with many other muscle groups to move the hips, lumbar spine, and legs. Within the subtle body, the psoas is credited as the mover of energy and related to the actions of the third chakra. Because it is located so deeply within the body, the psoas is also known to be linked to the nervous system and many emotional functions. Here is an excellent book for you to explore: The Vital Psoas Muscle Although it is only 128 pages long, it is filled with valuable information regarding anatomy/function and the emotional/spiritual qualities of the psoas. I have dedicated this month to restoring my body. Revitalizing the body is for everyone. A gentle, unhurried yoga practice permits us to nurture ourselves and establish a relationship between our breath and body that feeds us and brings new energy to our lives. I am finding that the deepest restoration work, for me, is accomplished through twisting postures. Twists are basically a way of giving yourself an internal massage. But be warned, in the process of healing, a twist is capable of releasing toxins into your blood stream that could give you flu or cold-like symptoms. So, if you are focusing on twists – drink extra water to dilute those contaminates. And, now for the really good news. Twists target the Manipura and Anahata chakras. As we have learned, these are important chakras that rule over your metabolism and breath mechanics. Esoterically, they are the centers of power, purpose, love and compassion. No wonder I feel so much positiveness when I restore via twists! For this Friday Focus, we reiterate a pose performed in class that I have termed “lifted twist”. Its unique quality is that it supplies us with a truly effortless release. Be sure to keep the twist initiating from your torso and stabilize the knees via some firm support. 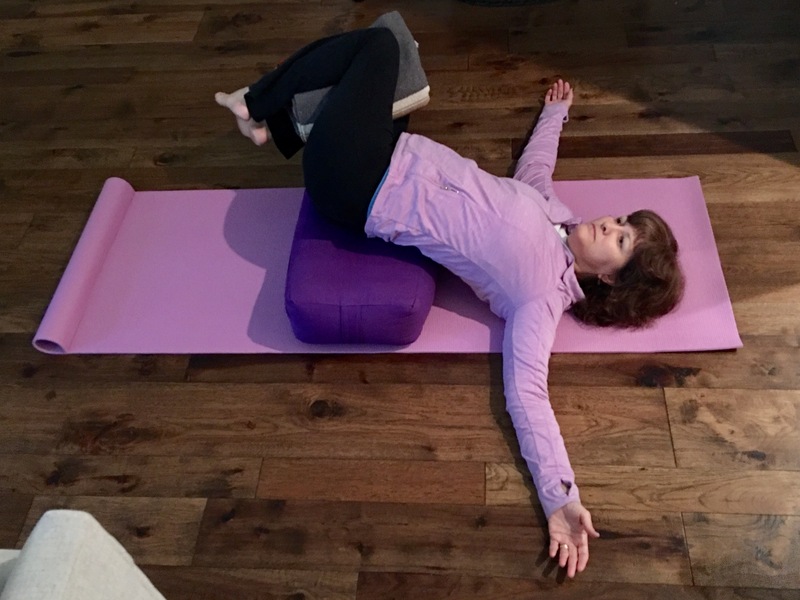 If you do not have a bolster or want to decrease the “lift”, use your blankets (1-2 depending on your comfort level) to stack underneath your hips and add a block between the knees. In our premier Friday Focus we learned a trick for straightening our Triangle pose. Today, we will delve into what makes a triumphant Warrior by concentrating on the hips. In order to obtain balance in many yoga postures, it is useful to learn to square the hips. Although this sounds very geometric, we are, after all, human in shape. Therefore, we should remember that our bodies are variable and that some hips may never be perfectly “squared”. But, as often occurs in the practice of yoga, we can apply modifications of the poses to work toward our intentions. So, let’s look to these variations of Virabhadrasana I or Warrior I Pose as we learn to level our hips. Since this is a balancing pose, we will begin by grounding. Find a comfortable Uttanasana (forward bend) and keep the knees soft. Feel the feet root into the mat. I teach this as a preparation for Warrior I because it allows beginners to maintain contact with the floor for balance. As you slowly begin to lift the leg, the tendency may be for your hip to rotate externally. This variation actually permits you to monitor the rotation of your lifted leg hip. Look back at your lifted foot. You will know rotation has occurred if you see the toes pointing outward. Redirect the rotation of the foot so that the toes of the lifted leg point more downward. Then you will know that the hip is moving back toward neutral. And, finally, using a chair for balance can give you more time in the posture to continue to work on the position of your hips. When the hips are level or square, Warrior I is much more accessible and true to form! As a side note, I am very lucky to have my daughter, Valerie, home early for the holidays, as my model this week! In an effort to provide my yogis with more information to continue their practices at home, I am introducing an addition to the blog called Friday Focus. These posts will give me the opportunity to spotlight a specific yoga concept or pose that we have covered in class. I would love for these topics to generate an interactive community of commenters who can share their observations, get more clarification or even hatch new suggestions. For this first Friday, I would like to detail a posture I presented in class this week. It’s a variation on Trikonasana or Triangle Pose designed to encourage torso length and, overtime, balance side to side asymmetry, especially in cases of scoliosis. The main objective of this triangle pose is to supply more length to the underside of the body where we tend to collapse. Begin standing with legs wide apart. Establish the Trikonasana stance: right leg/foot externally rotates, left leg/foot turns slightly inward. Then, extend your right arm toward a chair (or even a counter). Press away from the chair and stretch the right hip to the left. Move the top arm (or left arm) around the back of the body to encourage the revolution of the torso. Allow the head to look up if comfortable. Return to wide angle stance and repeat on the left side. After you try this elongated form of Trikonasana, feel free to leave us your comments or questions!